NASA's Advanced Propulsion Team has pledged to find a way for space craft to go faster - much faster. FTL - faster than light - faster. NASA's Harold White has been working since 2010 to develop a warp drive that will allow spacecraft to travel at speeds faster than light -- 186,000 miles per second. White, who heads NASA's Advanced Propulsion Team, spoke about his conceptual starship at a conference last fall. But interest in his project reached a new level this week when he unveiled images of what the craft might look like. Created by artist Mark Rademaker, who based them on White's designs, the images show a technologically detailed spacecraft that wouldn't look out of place in a "Star Trek" movie. Rademaker says creating them took more than 1,600 hours. As far as I know, Jack Williamson was the first to use the phrase "space warp; it appeared in his 1936 novel The Cometeers. As Earth's faster-than-light spaceship hung in the void between galaxies, Arcot, Wade, Morey and Fuller could see below them, like a vast shining horizon, the mass of stars that formed their own island universe. Another term is the Inertialess Drive from Doc Smith's 1934 novel Triplanetary. Other terms include stardrive (Arthur C. Clarke's classic 1953 novel Childhood's End), overdrive (from Murray Leinster's 1945 story First Contact) and the space warp (Frederic Brown's amusing What Mad Universe in 1949). 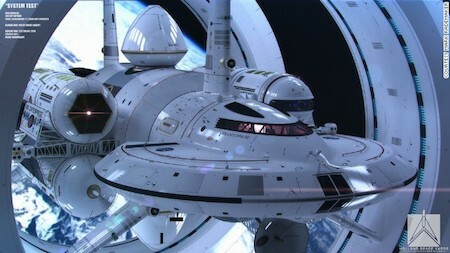 Be sure to check out Winchell Chung's faster-than-light page on Project Rho for lots of great references and pictures.